Gold dropped to new lows of $1,130 per ounce last week. This is surprising because it doesn’t square with the fundamentals. China and India continue to exert strong demand on gold, and interest in bullion coins remains high. 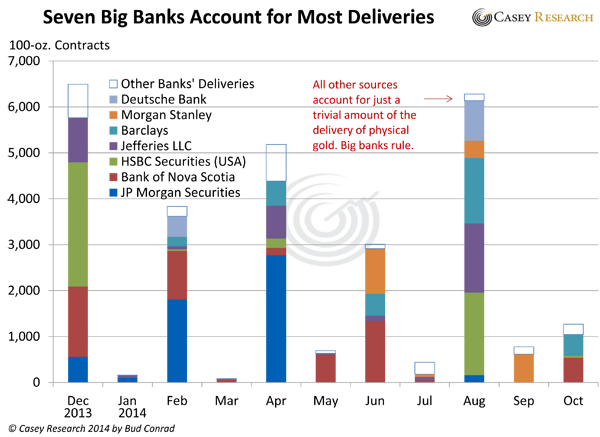 Many argue that the net long-term effect of such orders is neutral, because every position taken must be removed before expiration. But that’s actually not true. The big players can hold hundreds of contracts into expiration and deliver the gold instead of unwinding the trade. Net, big banks can drive down the price by delivering relatively small amounts of gold. 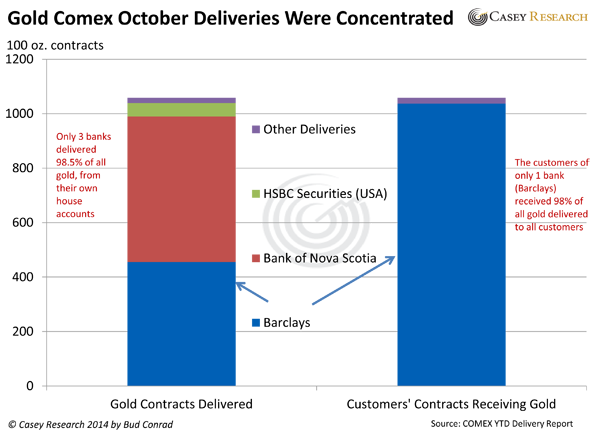 This chart shows that an amazing 98.5% of the gold delivered to the Comex in October came from just three banks: Barclays; Bank of Nova Scotia; and HSBC. They delivered this gold from their in-house trading accounts. The concentration was even worse on the other side of the trade—the side taking delivery. Barclays took 98% of all deliveries for customers. It could be all one customer, but it’s more likely that several customers used Barclays to clear their trades. Either way, notice that Barclays delivered 455 of those contracts from its house account to its own customers. The opportunity for distorting the price of gold in an environment with so few players is obvious. Barclays knows 98% of the buyers and is supplying 35% of the gold. That’s highly concentrated, to say the least. And the amounts of gold we’re talking about are small—a bank could tip the supply by 10% by adding just 100 contracts. That amounts to only 10,000 ounces, which is worth a little over $11 million—a rounding error to any of these banks. These numbers are trivial. Note that the big banks were delivering gold from their house accounts, meaning they were selling their own gold outright. In other words, they were not acting neutrally. These banks accounted for all but 19 of the contracts sold. That’s a position of complete dominance. Actually, it’s beyond dominance. These banks are the market. 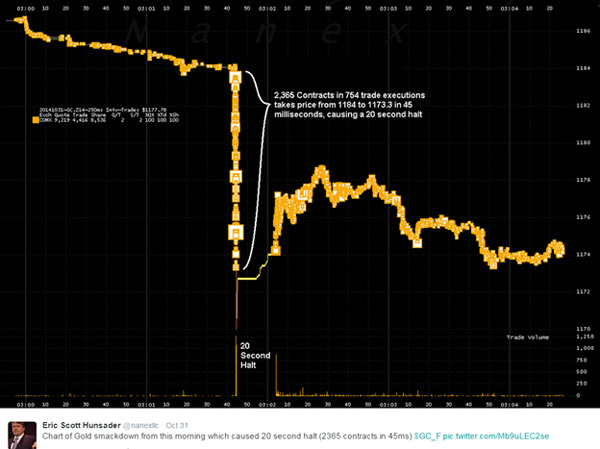 My point is that this market is much too easily rigged , and that the warnings about manipulation are valid. At some point, too many customers will demand physical delivery and there will be a big crash. Long contracts will be liquidated with cash payouts because there won’t be enough gold to deliver. I saw a few squeezes in my 20 years trading futures, including gold. In my opinion, the futures market is not safe. The tougher question is: for how long will big banks’ dominance continue to pressure gold down? Unfortunately, I don’t know the answer. Vigilant regulators would help, but “futures market regulators” is almost an oxymoron. The actions of the CFTC and the Comex, not to mention how MF Global was handled, suggest that there has been little pressure on regulators to fix this obvious problem. UBS is expected to strike a settlement over alleged trader misbehaviour at its precious metals desks with at least one authority as part of a group deal over forex with multiple regulators this week, two people close to the situation said. … The head of UBS’s gold desk in Zurich, André Flotron, has been on leave since January for reasons unspecified by the lender…. The FCA fined Barclays £26m in May after an options trader was found to have manipulated the London gold fix. The latter two banks are involved with the Comex. Eventually, the physical gold market could overwhelm the smaller but more closely watched US futures delivery market. Traders are already moving to other markets like Shanghai, which could accelerate that process. You might recall that I wrote about JP Morgan (JPM) exiting the commodities business, which I thought might help bring some normalcy back to the gold futures markets. Unfortunately, other banks moved right in to pick up JPM’s slack. Banks can’t suppress gold forever. They need physical gold bullion to continue the scheme, and there’s just not as much gold around as there used to be. Some big sources, like the Fed’s stash and the London Bullion Market, are not available. The GLD inventory is declining. If a big player like a central bank started to use the Comex to expand its gold holdings, it could overwhelm the Comex’s relatively small inventories. 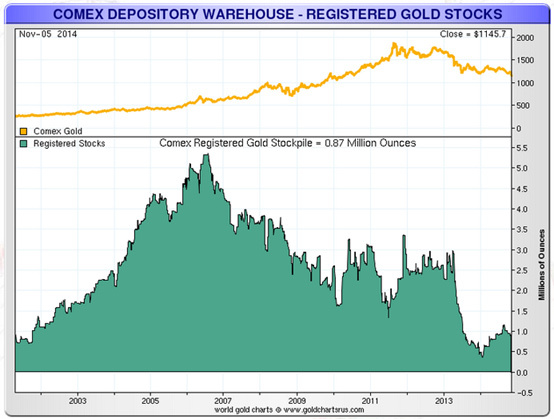 Warehouse stocks registered for delivery on the Comex exchange have declined to only 870,000 ounces (8,700 contracts). Almost that much can be demanded in one month: 6,281 contracts were delivered in August. The big banks aren’t stupid. They will see these problems coming and can probably induce some holders to add to the supplies, so I’m not predicting a crisis from too many speculators taking delivery. But a short squeeze could definitely lead to huge price spikes. It could even lead to a collapse in the confidence in the futures system, which would drive gold much higher. Signs of high physical demand from China, India, and small investors buying coins from the mint indicate that gold prices should be rising. The GOFO rate (London Gold Forward Offered rate) went negative, indicating tightness in the gold market. Concerns about China’s central bank wanting to de-dollarize its holdings should be adding to the interest in gold. In other words, it doesn’t add up. I fully expect currency debasement to drive gold higher, and I continue to own gold. I’m very confident that the fundamentals will drive gold much higher in the long term. But for now, I don’t know when big banks will lose their ability to manage the futures market.